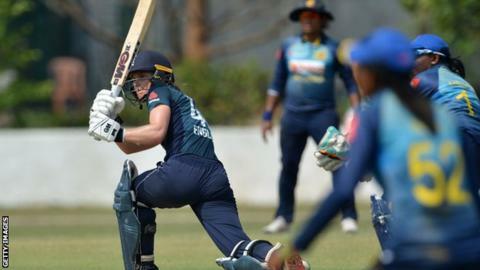 Amy Jones scored 76 and managed two run-outs as England's women sealed a comfortable 3-0 one-day series whitewash in Sri Lanka. The hosts were restricted to 174 all out from their 50 overs in Katunayake. Openers Jones and Tammy Beaumont (63) got England's chase off to a strong start, putting on 127 for the first wicket. Lauren Winfield (29) and Heather Knight then carried England to victory in just 26.1 overs. "We wanted to be really ruthless in the how we finished off the series," England captain Knight told BBC Sport. "The bowlers kept it really tight and we were clinical with the bat. When we get a chance to beat a team comprehensively we want to do it. Amy went out and expressed herself and took on the bowling." All three ODIs count towards the ICC Women's Championship, which determines qualification for the 2021 World Cup. England now face Sri Lanka in three Twenty20 internationals, which start on Sunday 24 March (04:30 GMT). This was another hugely impressive performance from England, who can't be accused of taking their foot off the gas having already won the series. The opening pair of Amy Jones and Tammy Beaumont excelled with another 100-run partnership - they've batted Sri Lanka out of every match, both batting first and second, and will surely be the openers in the Women's Ashes this summer. This win was a seventh on the bounce in the Indian subcontinent, a fine return after a difficult start to the tour of India last month.